The Model 450 is a hand held portable reader and is compatible with all Brinell type machines. The reticle is calibrated in 0.1 mm units over a range of 6 mm and the diameter of the microscope field is 7 mm. NIST Traceable Certification available. The instrument is quality built and durable, making it suitable for both laboratory and shop. The Brinell Microscope Reader allows the user to measure the diameters of indentations made by the ball indenters of all Brinell type hardness testing machines for ferrous and non-ferrous metals. 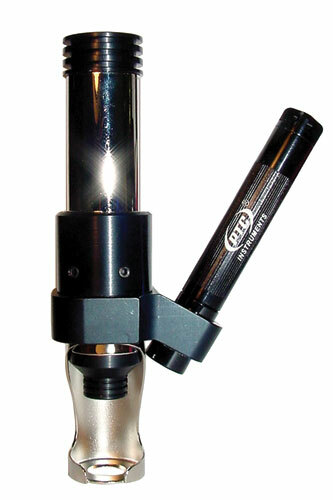 The Model 450 Microscope is also easily used as a calibrated portable microscope. Reticle scale length 6.0 mm. Weight 7 1/2 oz. (213 g). Shipping weight 2 lb. (907 g).